It's definitely not easy being one of the only few out-of-state students to attend a state university, but I'm the most fortunate chick alive to have met the people I did. The relationships you have with your friends and acquaintances from college are seriously like no other. They've seen you at your best, your worst, your drunkest, your freshman 15, your dirtiest, and your dumbest. And then you graduate. You end up in a long distance relationship with everyone you had the pleasure of seeing everyday. You road trip to as many graduation parties as you possibly can, and the next time you see those amazing individuals are special occasions such as birthdays, alumni weekends, and when you're lucky enough to have an extended weekend at work. It's the saddest thing. Today is my best friend's 23rd birthday, so I'm throwing it back to the cutest [and easiest] long distance BFF frame I made as a graduation gift last year. Totally miss that betch. Hardest / most tedious part first! Type your BFF's current state (or country) followed by "outline" into Google and click images. Click the photo with the darkest outline, then right-click "copy image", and paste it to a blank Microsoft Word document. Repeat for your own state onto the same document. Drag the corners of the two photos making sure they're an appropriate size. Print onto plain computer paper and cut out your states. 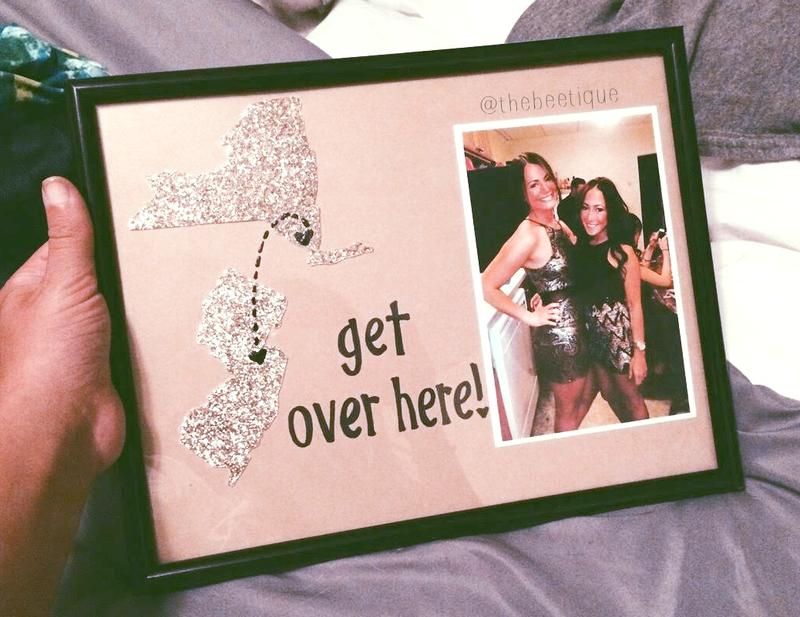 Make sure the states aren't too large to fit on the backdrop (8.5" x 11" scrapbook paper) of your frame. With a pencil, trace your white cut-out states onto the cardstock glitter, color, or patterned paper. Make sure your states aren't backwards! If you used a glittered sheet like myself, it'll be tricky to write on the front facing side. No problem, just trace your states BACKWARDS onto the BACK side of the glittered paper! Lay your photo and two cut outs onto the 8.5" x 11" scrapbook paper to make sure everything fits nicely. Your states should be positioned in accordance to where they are on the map, for example, New Jersey is right below New York, to the left of Long Island. Leave room to write a quote or statement. Glue it all! Sharpie an "x" or heart above yours and your BFF's town, then add some distant dots or dashes to connect them. Hand write your statement in marker or sharpie of choice. Let all glue and markings dry. Gently place into your frame, wrap, and voilà!